Firebird Raceway, Chandler AZ Nov 14th 2010: After a long season beginning back in January, Powersports Outlet Racing won the CCS Southwest Lightweight Championship aboard their Hyosung GT 650R. The weather was perfect for the last race of the season and the team took advantage with two race wins and two second places on the day. Although a rules change this year did not allow the Lightweight Bikes to fight for the Overall #1 plate, the team took pride in knowing that they amassed the most points and would have won the overall expert plate any other year. When all was said and done the team won all classes they contested: LW GP, LW Superbike, ULW Superbike, Thunderbike and the Overall Lightweight Championship. 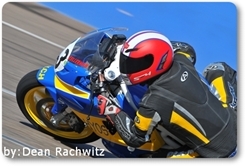 Powersports Outlet Racing is currently gearing up to contest the WERA West series in 2011. The little Korean bike that could, has proven itself to be a reliable, race winning machine and we are proud to be associated with a great up and coming brand. We look forward to competing on a larger stage next year and showing off the potential of the Hyosung GT 650R.